In 1990, Germany united. For the first time, a Russian astronaut flew into space on an American space shuttle. Phil Collins was at the top of the charts and in Vietnam, there was a shortage of meat. This dire situation (not the musical one, mind you, we mean the food) is important because vegan nutrition alternatives grew from it. 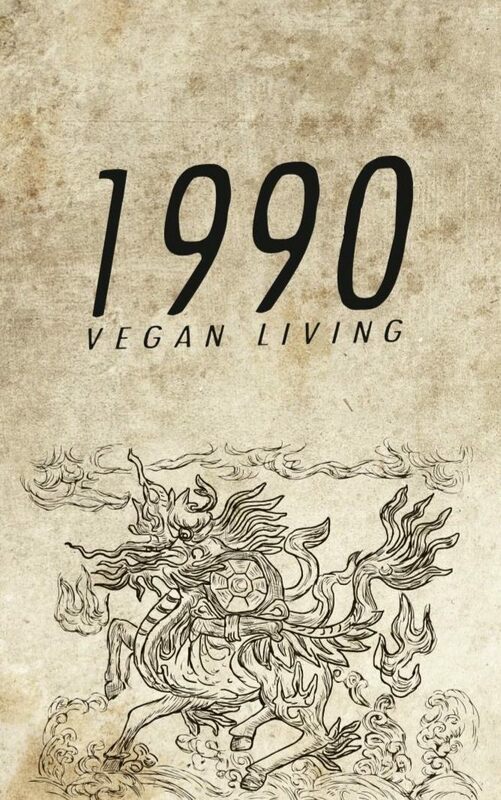 The vegan Vietnamese Restaurant 1990 at Boxhagener Platz has dedicated itself to this time and modernised tasty vegan dishes from fresh vegetables and exotic spices. The secret has been out for a while now that the vegan Vietnamese Restaurant Cat Tuong on Kastanienallee is the place to go to convince carnivores of the tastiness of vegan cuisine. So it’s absolutely right that exactly that team has now opened the second restaurant a little further to the East. The demand for good, agreeable ingredients – let’s spell it out: no glutamate of the devil is ever used here – is met all the way up to and including the tap water, which is spring water from a Leogant filter. So this time travel into the past is, at the same time, into the absolute present: tasty, agreeable, environmentally friendly and purely vegan cuisine, cooked in Berlin, inspired by Vietnamese tradition. The best advent cuisine, before the turkey and fondue get you. What makes a holiday perfect? When we get the chance to take some time for ourselves. When we can enjoy rest and activity without having to comply with appointments and schedules. When we feel truly welcome and are given space for inspiration and relaxation. Well, we have something for you. The quaint village of Lech am Arlberg (in Austria) has only 100 inhabitants and, for the past 24 years, the matchless 4-star hotel ‚Stäfeli‘. 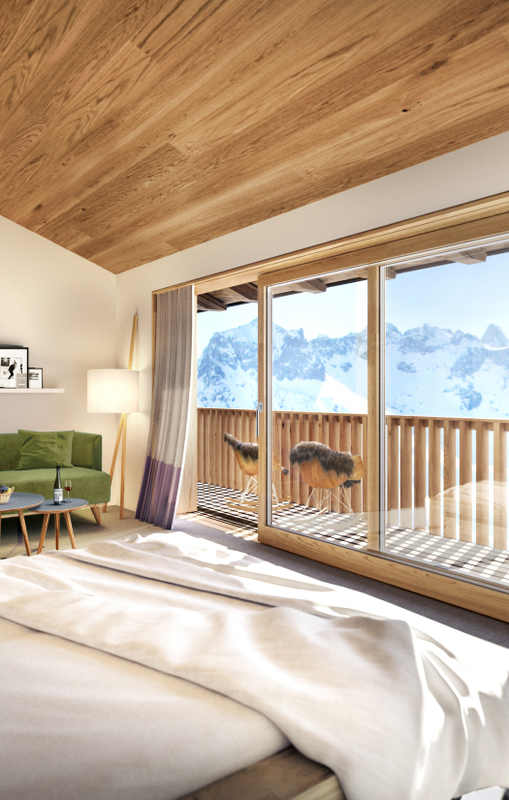 Right on the hillside, imbedded in spectacular scenery, run with a lot of love and care and just recently elaborately remodelled and renovated, the Stäfeli (you just want to say that again and again, don’t you?) offers time and space in abundance to just let your thoughts, ideas and dreams fly. The sophisticated and stylish rooms are equipped with furniture and accessories from Gervasoni, Designers Guild or Varaschin and Rausch. There’s a spa with an indoor pool with counter current, water spouts, a sauna and a gym that offers Chimosa workshops and courses such as boxing yoga. If, that is, you have any energy left after a day on skis or snowshoes. Those who prefer to relax can resort to one of the many havens of peace and quiet. In co-operation with Stephanie Wissmann from the blog Stepanini, a literary concept was developed for each room that let’s you dive into innumerable topically matched books and texts to your heart’s content. Our highlight, however, is the ‚ZeitRaum’ (meaning time-room) which is all about spending time together, literally. Together with local decorators, game tables were designed for young and old to enjoy themselves together in Summer or Winter and turn their backs on modern technology. Delicious food is served in the restaurant ‚s’Achtele’, amongst others. People, this is the perfect holiday. The Stäfeli is re-opening tomorrow. Inquire about booking on their website. Ever heard of “winter tree-topping”? Neither have we. But the word does have a certain ring to it that won’t let us go. Something comfortable and at the same time, exciting. And that’s what it is actually is. “Breathe deeply and winter tree-top it” is the motto of the bonfire Christmas in Beelitz-Heilstätten. A tree crown path was built over the ruins of the former lung sanatorium in Fläming last year. 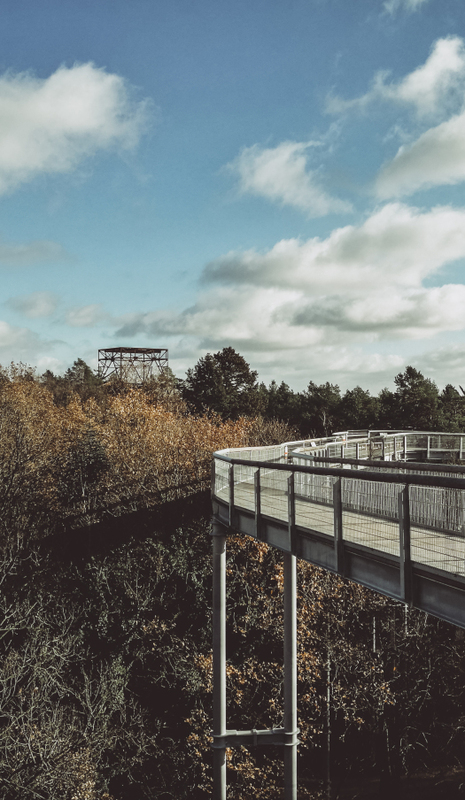 In almost dizzy heights, you can roam across the eerie remains of the institute, make up some spooky stories or enjoy the forest and marvel how nature is reclaiming the area in and around the buildings. Exactly this ambience is where you can experience a truly atmospheric advent. It’s the festive alternative to the hustle and bustle of the commercial Christmas markets with their fun rides and Wham!-loops – the club Baum & Zeit invites you to enjoy homey bread-on-a-stick, children’s theatre and punch from the fire pot under the giant Old Berlin Christmas Pyramid. And in between that, the view and insights from the tree crown path are the perfect preparation for slowly stepping away from the past year and turning your perspective to all that’s coming. On the advent weekends, the tree crown path is open from 10am to 4pm on Fridays and Sundays and 8pm on Saturdays – and from 10am to 4pm every day during the Christmas holidays, including January 3rd. Have you ever been to Ha Duong’s minimalistic luncheonette The Klub Kitchen? Boy. Oh. Boy. It’s. Good! And on top of that, it looks soooo good, too! 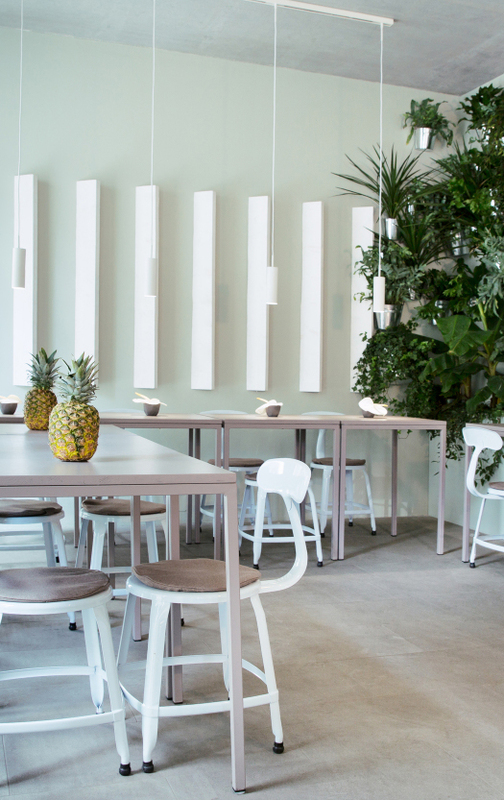 The successful fashion designer traded needle and thread for cooking spoons and, remaining true to her fashion principles – minimalism, high-class material, unobtrusive colours – has created a café-restaurant with international cuisine in the middle of Mitte. The heart of the Klub Kitchen is the open kitchen. Here, specialities from around the world are prepared from fresh ingredients daily – the composition are made up of, for example, avocados, pomegranate seeds, quinoa, edamame, buffalo mozzarella or fresh fish make our food-loving hearts beat faster, they fill us up and make us happy. The menu of the Klub Kitchen changes regularly, so your taste buds are guaranteed to never get bored. You live or work in Mitte? Well hurry up and get there fast, this is our new favourite lunch spot. You don’t live or work in Mitte? Never mind, get there fast, too. Same reason. 1986, Wham! gave away their heart for Christmas, 8 years later, Mariah Carey didn’t care for any presents and just wanted her sweetheart for Christmas. Today, we think a present or two is something lovely – be it to give or to keep. But gifts with soul, please. The fair fashion label FOLKDAYS from Berlin is setting up temporary shops with befriended brands and makers in the run up to the Holidays for fair and sustainable Christmas shopping. The counterpart to the thoughtless power-consumption during the heavy advent season. 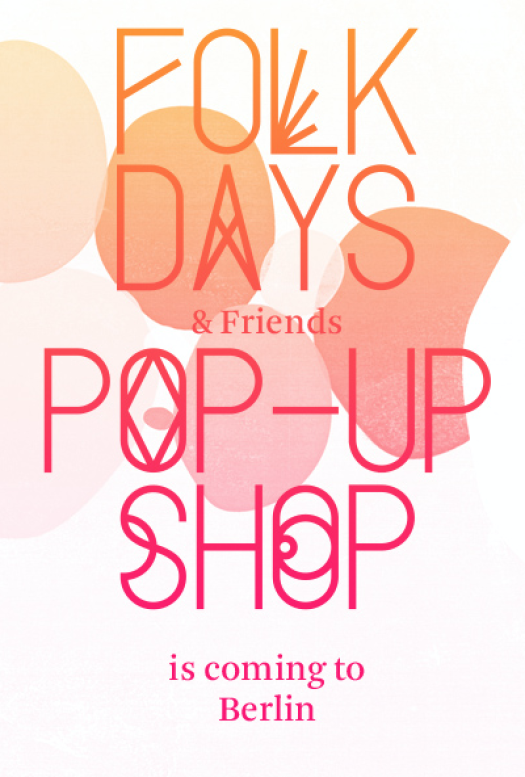 And there quite a few soulful names amongst them: The one-month-pop-up-store in the FOLKDAYS showroom will be housing fairness-favourites such as Selo with their refreshing soda made of coffee cherries, fabulous organic cosmetics from Und Gretel, Conflict Food with groceries from areas in crisis or the vegan condoms from einhorn Condoms. So there will a lot more to shop than fashion and accessories and not only in Berlin. The B-Lage in Hamburg’s Kampstraße will be hosting the pop-up store with 14 different labels at the end of November and in the beginning of December, FOLKSDAYS is bringing the idea to Munich. And the best is yet to come: we’re giving away a shopping voucher worth 50 Euros for each of the locations to the particularly fair thinkers and givers amongst you. Send an email headlining ‚ALL I WANT FOR CHRISTMAS IS GOOD‘ and the city of your choice to hurra@muxmaeuschenwild.de. If you want you know what’s really going on in Berlin, you’ll end up consulting the magazines Zitty or tip eventually. This can cause confusion occasionally (Zitty, Tip, Tiity, Zippy) but does help to end up in the right place at the right time in this beautiful city. Now, the two have created a real place together, and by that, we don’t mean the editor’s office but – muuuuuuch better – a joint bar. 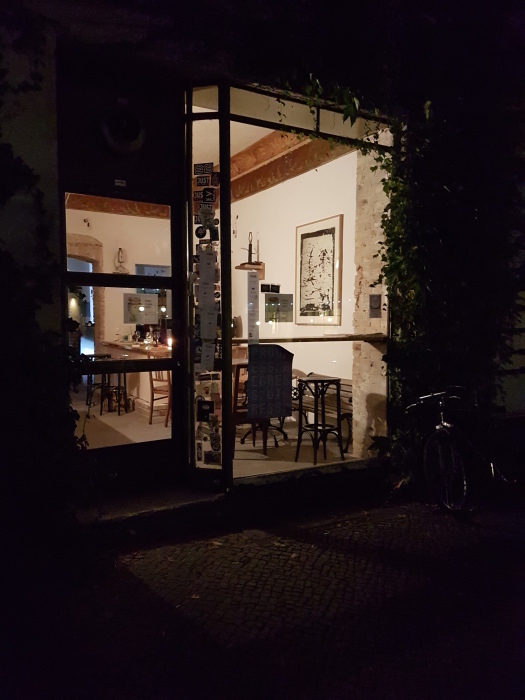 The cozy Kinski-Bar is closed, now open is a Zitty-and-tip-Bar, still nameless but with this promise: Thursdays to Saturdays, you can say cheers in the Friedelstraße 27 in Neukölln. With what exactly and how it’s all going to be nobody knows – not even the owners and even less us. Zitty says: “It’s all very improvised, it was kind of a crazy idea”. And we think: every bar should start with a crazy idea. In our 2-minute-interviews, we regularly ask exciting people to tell us about about a magical place, anywhere in the world. And now it’s our turn. Although – to be honest – it’s really not easy for us to reveal this wonderful little treasure, this little heaven on earth. The Dada is the most exclusive holiday home in Germany. 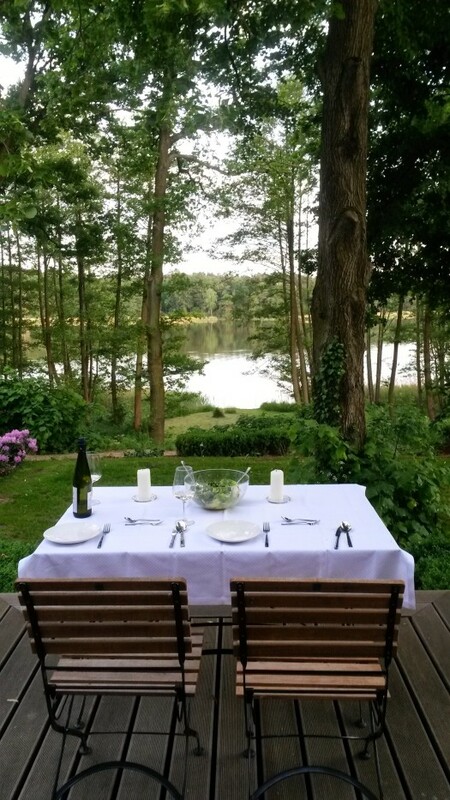 It’s located in the former artists’ enclave Waldsieversdorf (hence the name) in the natural preserve Märkische Schweiz about 50 kilometres east of Berlin on a 900 sqm lake side property in the middle of serenity and nature. On 140 sqm of luxurious living space, ‚The Dada – Hide Away‘, as it is officially called, offer a new, simple kind of luxury for two to four guests – with a 24-hour concierge service, the classiest interior and extras that only let your heart beat faster but also let you forget any trace of big city hustle and bustle. With the wooden panels, the circumferential veranda and its many terrace doors, The Dada is reminiscent of an American farm house or a luxurious cabin at a Norwegian fjord. The two differently designed suites are equipped with selected pieces of furniture and accessories by Gervasoni, Graff, Lovely Linen, SIKA Design by Nanna Ditzel or AY Illuminate. You prepare your meals in proper style at the SMEG Range Cooker von SMEG or the FEUERRING barbecue. The corresponding wines are waiting at just the right temperature in the wine fridge. The private cinema has an endless selection of German and English films (and popcorn) in store, the spa area offers a Finnish sauna, a Dutch tub with a wood stove, a chromotherapy shower, a free-standing bath tub, a Gym in a Bag, yoga mats and much more. Leogant has made the water in the entire house spring-fresh. You can book The Dada starting at 450 Euro per night and person. We’re on our way. Cornflakes? Sure you know ‘em. Fruit Loops, Smacks and the sort sweetened up pretty much every child’s breakfast morning. But what are Fruity Pebbles, Lucky Charms, Puffs or Shreddies? Don’t really know ‘em. Here, at least and without relevant international experience. Those of us who spent their days, weeks or months taking care of kids in the US, taking care of farms in Australia or taking care of their studies in whatever cool place abroad sometimes crunchily reminisce themselves back into a colourful flake heaven. Just the memory of the varicoloured Hagelslag on toast from the Dutch school exchange can be enough to take you straight there. 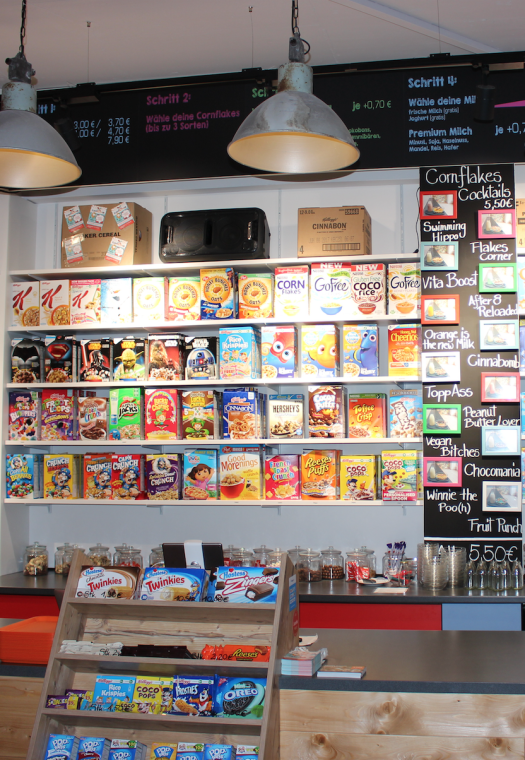 These crunchy emotions are what three guys from Cologne have given into: Max, Thomas and Mark share a passion for cereals and opened the first Flakes Corner in their home town in 2015 and now – thanks to Getreideart – another one in Berlin. And they have them all. Large, small, fruity, chocolaty, individual or in a menu (yup, take-away snacks, too). Besides being able to choose between the most way out flavours in the form of flakes (Cookies’n’Cream! Marshmallows!! ), you can also select the matching milk – be it mint, strawberry or bubble-gum-flavoured or lactose-free variations. Our recommendation is the secret favourite of the three founders, the „Peanut Butter Lover“: A blend of peanut butter crunch and chocolate crispies, dipped in strawberry milk and topped with a Malteser. Now, that’s just obscene. 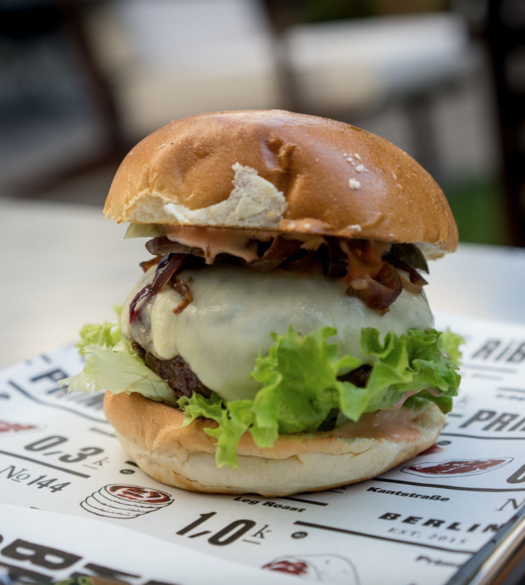 There are plenty of good burger joints in the capital and elsewhere in the country. But now, in the upcoming Berlin neighbourhood City West, a butcher has lodged himself in the ground floor of the SIR Savigny Hotel and suddenly, everything is different. Better. The name is the game: counters of chrome and steel, tiled walls and ceilings, a solid wooden table without frills, the cow hanging in front of the window as a symbol of what it’s all about here: really good meat. Since 2012, Amsterdam has been celebrating The Butcher and now, it’s Berlin’s turn – because The Butcher isn’t just any burger bar. Only the most exquisite Aberdeen Angus Beef is good enough for a Butcher burger. Fresh vegetables, perfectly matched herbs… and, of course, the top-secret secret sauce. And it’s not about being pernickety, it’s all about the highest quality of the ingredients. We recommend the Butcher with cheese, a classic cheeseburger that is just perfect in all ways. From the meltiness of the cheese to the amount of onions to the hand-pressed patty. Or Mama’s Meat Ball Sliders: Mini-burgers including pickles and goat’s cheese. And a fabulous milk shake to go with that. So remember: I got 99 problems, but the burger ain’t one. My God, the Uckermark is beautiful! Countless lakes, soft rolling hills, enchanting avenues and the vastness of untouched and, above all, very, very green frontal moraine landscapes. And all of this just a stone’s throw away from Berlin. 80 kilometres, so about one hour by car or train is all it takes to get to heart of this idyll. We have discovered a particularly special place, the greatest treasure in a green paradise, if you will. The manor Röddelin, a stately home with garden from the late 19th century has five bedrooms, five bathrooms, two living rooms, a kitchen, a terrace and more. The landscaped garden connects the house and its modern interior with the adjacent lake Röddelinsee. What a lovely place to spend a relaxed week of vacation with your nearest and dearest, or just unwind for a few days. 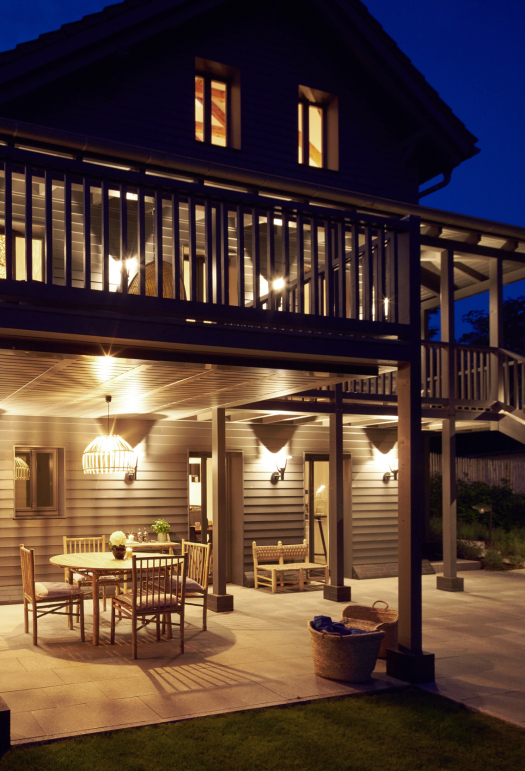 If you’re looking to get creative, the home is also available to rent for business meetings, workshops or yoga retreats. Oh, and you can, of course, also plan your wedding here. Practical, as you have your mother-in-law including entourage in the house with you. At a sufficient distance, of course, because the 320 sqm. do offer enough space. The hard facts: dreamy idyll, beautiful house with plenty of sleeping and living space for up to 10 Persoons for 1.500 Euro/week. We’re coming!